A technician doing residual spraying. 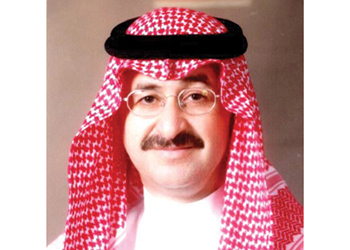 Hotels, palaces and luxury villas are places that need great care and attention when it comes to pest control, says MOHAMMAD ARIF HUSSAIN, entomologist at Saudi Arabia’s Masa*. Pest control operations take on a larger magnitude and importance in hotels, palaces and luxury villas, which feature a number of buildings and areas dedicated to diverse operations, ranging from residential and kitchen areas to bars, commercial offices and retail shops. And while these areas can provide a haven for pests, such as termites, cockroaches, rats, mice, ants, mosquitoes and flies, any pest control action taken must be based on principles that are effective, safe, legal and civilised, bearing in mind that apart from people they may accommodate pets as well. Therefore, before attempting to control pests, it is important to understand the reasons why such a problem exists in the first place. Various aspects of the biology and ecology of the species involved also have to be considered in pest management. Pest management is a business of technology. Although there are many viable approaches, chemical pesticides continue to play a large and important role in the solution to most pest problems in urban and industrial situations. This places a heavy responsibility on the shoulders of the pest control industry. Mousaied Al Shieshakly, owner and GM of Masa. In recent years, there has been a growing public concern regarding the use of pesticides, some of which have the potential to harm human health, the environment, or both. Therefore, in Saudi Arabia, for instance, it’s important to operate under the legal restrictions imposed by the Ministry of Agriculture and Saudi Food and Drug Authority (SFDA) and the attendant laws of the kingdom. This calls for personnel in pest control firms to be certified or registered. The competence of certified commercial applicators depends on factors such as pest recognition, label comprehension, proper use of pesticides, appropriate equipment, application techniques, toxicity, safety and environmental awareness. The certification system is simply an assurance that we have well-trained and qualified persons into whose hands we can place the various types of pesticides. The human dwelling is the principal site in which structural pest management is conducted. Others include a variety of food handling establishments, offices buildings, hospitals, modes of transportation, non-food industries and recreational areas of hotels, palaces and luxury villas. Each of these indoor environments presents its own problems with respect to pesticide use and other approaches to pest management. Controlling pests in hotels, palaces and luxury villas requires more than just pesticides. Good co-operation with the clients, effective scheduling, regular inspection and record-keeping, along with a good measure of diplomacy are essential for an organised method of pest control treatment in these premises. • Client cooperation: It needs to be ensured that the client’s staff isn’t simply sitting back and leaving everything to the pest control operator and that they all cooperate in the pest control efforts. The operators will need access to potential pest sites including small zoos, laundry areas, machinery rooms and storage areas. A lockable closet to store pest control supplies, including an extra uniform, pest report forms, and a ladder are all required, which have to be worked out in an initial meeting with the client. • Mapping and scheduling: It is important to obtain or draw maps of each area within the complex to determine which areas are around the problem sites that are to be treated. This also includes the hours of operation of each facility and the best time for treatment. This will help to set up a treatment schedule. • Inspection and record keeping: The client’s representative should be the main contact for new pest sightings or problems. Regular meetings should be held with department supervisors to explain the programme and discuss progress and problems. 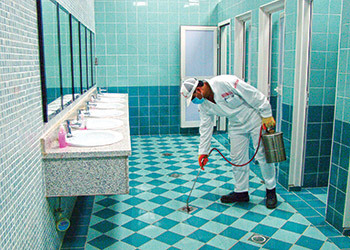 Detailed reports should be provided on sanitation, when and where pest control services were last performed and what chemicals – including their material and safety data sheets (MSDS) – and procedures were used. • Control: The control methods used in large establishments depend on the particular site of treatment. It is important to focus on room service carts, which can spread infestation and the procedure for handling emergency pest complaints. It is essential to use odourless insecticides in these premises. Among all the pests generally found in buildings, termites are the most destructive. Hence, termite control is an important element in building construction to maintain and protect the wood and other materials that make up the structure. A technician doing spot treatment. Termite control is now gradually shifting from conventional soil treatment methods to environment-friendly and easy-to-use methods. The application of liquid termiticides to soil has been the mainstay of subterranean termite control for over 50 years. The objective is to create a continuous chemical barrier that excludes termites in the ground from entering buildings. And although liquid soil treatment is a key method of preventing or alleviating termite attack, it should not be viewed as a substitute for good construction practices. Eliminating termite-conducive conditions, such as excessive moisture and wood-to-earth contact, will further enhance the effectiveness of termiticide treatments. Correcting these deficiencies is even more important today, given the higher cost and shorter residual life of the more recent termiticides, and preponderance of industry litigation. 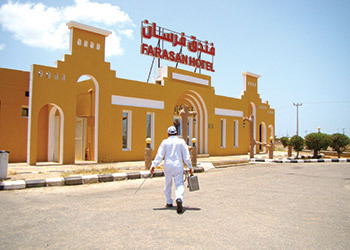 *Saudi-based Masa Establishment for Pest Extermination, Maintenance and Contracting has been protecting hotels, luxury villas and palaces and other commercial properties against pests for over 35 years now. Its staff are trained, certified and insured for this particular kind of work. Furthermore, Masa has gained a stronghold in the pest control industry by strict observance and maintenance of high-quality service standards. A member of 13 international pest control associations, the company exerts every effort to boost public awareness of the pest hazards in premises and urges the public to cooperate with a professional pest control operator to maintain a healthy environment.